Lily is determined to help other children too! 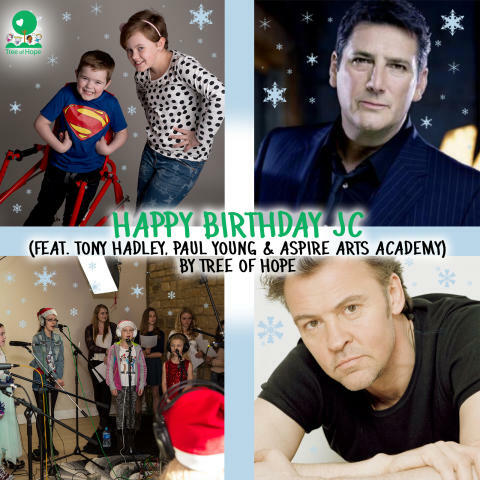 Her Christmas song ‘Happy Birthday JC’ is being re-released for this Christmas to raise funds for Tree of Hope to support more children to access life changing treatment and surgery. Kat Stephens of Aspire Arts Academy said: “This is such a fun song for children to sing at Christmastime, they can easily learn the words and sing their little hearts out! In most conventional Christmas songs children sing backing vocals, supporting famous recording artists, but this time it’s a role reversal as Tony Hadley and Paul Young wanted to support this great song by adding their vocals to the children's lead vocals. The recording took place at the Fitdog Recording Studio in Gayton, Northamptonshire. The official release date is Monday 1st December 2014 and by buying the single on that day the public will give it the greatest opportunity to chart, reaching millions of listeners and raising money for sick and disabled children not just this Christmas but every single Christmas in the future. The song “Happy Birthday JC” is available to download from iTunes. As one reviewer says “This little tune is not only catchy, the story behind it tugs the heart strings. … It's a good cause, get behind it for Christmas, who knows it could be a hit”.